Activity: Place a group of common objects on a table and give your child a few moments to study the collection. After your child has studied the group of objects, ask him to turn around. 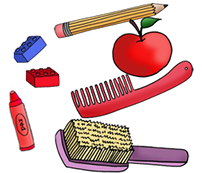 Remove one of the objects and ask your child to look at the group of objects again. If he cannot tell you, then encourage him to ask for clues... What color was it?, Was it big or little?, was it soft or hard? Other Activities: To make the game more difficult, increase the number of objects and choose items that are similar in sizes and shape. You can also shorten the time that your child has to view the collection or the time that he has to determine what object you have removed. Another twist is to rearrange the collection in addition to removing an object.